Is the iPhone the OS 9 of Phones? 'iPhone as Modem' Tethering Hack Revealed! "I'm starting to wish that Apple hadn't cheaped out with the plastic backs on the iPhone 3G." "Let's be honest here for a second. Cracks don't appear. Cracks don't form. They don't develop. Your iPhone 3G cracked because you dropped it. 'Fess up! It's not a manufacturing defect if your phone takes a tumble down a flight of stairs. This is why we can't have nice things. "Just kidding. Apple could have has another iPod nano or G4 Cube problem on its hands: careful users are seeing cracks and fissures on their new iPhone 3Gs. MacRumors has a thread about new, white iPhone 3Gs (which haven't been 'dropped or pressed') that are beginning to show hairline cracks around the edges and near the buttons and headphone jack." "All is not well in iPhone 3G land, however. The folks over at Engadget noticed that a number of people are noticing stress fractures/cracks in their iPhone 3G casings. The cracks seem to mostly affect owners of white 16 GB iPhone 3G models, but owners of black iPhone 3Gs have reported problems as well (but to a lesser degree)." "I still consider the iPhone to be one of the greatest technology inventions of the decade. And the new iPhone 3G is even better than the original. The iPhone 2.0 software, especially the App Store, is a significant leap forward from iPhone 1.1.4. As for MobileMe, on balance (assuming the service can ever get past its initial hassles and actually work as intended), I believe it is marginally superior to the .Mac service it replaces. "So what's the problem? The problem is this: The new hardware features in the iPhone 3G and the new options in MobileMe are largely irrelevant to me (and I suspect to a lot of other people as well)...."
"Your mobile phone is lying to you, according to Daniel Rutter at Dan's Data on Tuesday. Mobile phone battery indicators are designed to hedge towards the full side to keep the user making calls - and spending money. "After investigating the issues behind the mobile phone's signal strength bars, Mr. Rutter turned his attention to the battery indicator. "With that technical knowledge, mobile phone makers, given a choice, would like the user to think that there's just a little more charge than there really is. There's ample motivation for this...."
"Guess what? The more you use your iPhone, the faster its battery drains. This is hardly a surprise. "Further, certain iPhone features require a bit of extra power and will drain the phone's battery even faster. Again, not much of a surprise. It's simply a matter of physics. "Still, it's worth pointing out exactly what these battery-eating features are. It may be of particular interest to iPhone 3G owners, many of whom claim that the 3G's battery life is significantly shorter than that of the original iPhone...."
"Remember back in the day when you would tell all your friends and family how the Mac rocked? How it was the easiest-to-use and most powerful computer light years of anything before it? And then they bought it. And, a few weeks later you'd get a call about crashes. Oh, you'd say, that's simple, it must be an extension conflict. Or . . . don't run too many applications or it may crash! "This pattern would inevitably repeat itself a few times until, when recommending the Mac, if you were a good soul, you would get a slight lump in your throat. "OS X has thankfully obviated any concern for guilt. The occasional kernel panic aside the operating system is rock-solid. "I recognized yesterday, as I needed to make a phone-call and had to reset my iPhone for the third time that day, that familiar feeling of dread. Waiting for my iPhone to reboot brought me back to those Classic OS days. It isn't quite as bad as running Extension Conflict and waiting for the computer to reboot 20 plus times to tell me which extensions are in conflict (It's utterly amazing to think such a product existed, isn't it?!). But a phone is different than a computer in how we need it." Link: Is the iPhone the OS 9 of Phones? "A prominent American cancer doctor has warned his colleagues to limit their use of cellphones because he believes they might pose a cancer risk, while other experts disagree. "Dr. Ronald B. Herberman of the University of Pittsburgh Cancer Institute wrote a memo to the hospital's 3,000 faculty and staff urging them to take precautions when using their mobile phones, The Associated Press reported. "He said that although current medical data does not indicate a clear link between cellphones and cancer, he believes people should not wait for current and future studies to be concluded. "Herberman said future research could yet prove a link between the electromagnetic radiation produced by cellphones and an increased risk of cancer." KDKA.com has posted 10 practical advice tips on limiting your exposure to cellphone radiation. 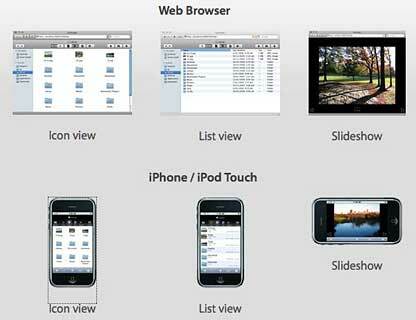 "Want to use an iPhone to deliver data to your notebook or other device? Apple and the phone companies didn't want us to have this capability, but smart users have found a way. "We're not going spell out in detail how it's done - for that, you should go to cre.ations.net for some illustrated and reasonably detailed step-by-step instructions. NB: the method requires a jailbreaked iPhone, but that's not likely to be a surprise to anyone." Link: 'iPhone as Modem' Tethering Hack Revealed! "Is 3G really two times faster? "We had an opportunity to test the new iPhone 3G in both 3G an EDGE mode in the middle of San Diego where both coverage is strong for both. Is 3G really 2 times faster?" "...FairPlay makes it clear that those apps should be able to run on multiple iPhones...."
"If you've ever had the urge to add functionality to your iPhone, a new program called DataCase can help you do that. In fact, this nifty app will turn your iPhone into a wireless drive. You can store your files on it just like an external drive. It will even show up in your Finder window as such." "The new iPhone 3G has a nicer shape, GPS, and of course 3G speeds in the big cities," says a blissed-out David Pogue. "But it's the iPhone 2.0 software and the App Store that really change the game." A year ago, Pogue, the New York Times technology columnist and best-selling author, helped usher in the iPhone Age with his entertaining, definitive, best-selling guide, iPhone: The Missing Manual. Now Pogue is back with a bigger, better, up-to-the-nanosecond second edition - a witty, complete guide to both the iPhone 3G and the original iPhones with the iPhone 2.0 software. iPhone: The Missing Manual, Second Edition (O'Reilly) is the first and best book about every Apple improvement to its own second edition - the iPhone 3G and iPhone 2.0. Over 100 new features are demystified, troubleshot, and evaluated: GPS position tracking, MobileMe synching, Microsoft Exchange server synching, make-your-own ringtones, geotagging photos, and much more. 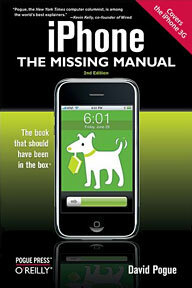 The print version of iPhone: The Missing Manual, Second Edition can be purchased on or around Aug. 15. But for those who don't want to wait for the book (or prefer a virtual one), an electronic downloadable version of the book is also available, in three different formats. The PDF (available now) and EPUB versions can be read on the iPhone; the Mobipocket version can be uploaded onto the Amazon Kindle e-book reader. Best of all: those who pre-order the print book/electronic bundle (which includes all three e-book formats - PDF, EPUB, and Kindle-compatible Mobipocket) instantly save 70% on the book. Teeming with high-quality color graphics and filled with humor, tips, tricks, and surprises, iPhone: The Missing Manual, Second Edition quickly teaches you how to set up, accessorize, and troubleshoot your iPhone. Instead of fumbling around, take advantage of this device with the manual that should have been in the box. It's your call. David Pogue is the weekly personal-technology columnist for the New York Times and an Emmy award-winning tech correspondent for CBS News. With 3 million books in print, he is also one of the world's best-selling how-to authors. In 1999, he launched his own series of complete, funny computer books called Missing Manuals, which now includes more than 30 titles. PR: FarFinder lets you access files on your Mac from any computer or iPhone anywhere you happen to be. Clever downloads and uploads: Fetch files and folders easily, and send files to your Mac too. Email files on the go: Email files without even downloading them first. Great on the iPhone. System requirements: FarFinder requires Mac OS X 10.4 or higher. Connecting computers can run any operating system as long as the browser requirements are met; supported browsers are Safari 2+, Firefox 2+, Camino 1.5+ and Internet Explorer 6+. While Internet Explorer is fully supported from a functional perspective, appearance and performance will not be as good as with the other, more standards-compliant browsers. The first thing typically added to the iPhone 3G is a case to protect the phone. Ivyskin announces a new, premium range of iPhone 3G cases and accessories that are second to none in the market today. Designed to enhance the iPhone experience, the range uses the latest Polycarbonate and Polysilicon to ensure a sophisticated look and feel. "Body and screen scratches, regardless of how careful you are with your iPhone, are inevitable," said Mike Panahi, Founder and President of Ivyskin. "We built a full solid screen cover into our new XyloT3's enclosure that's specifically designed to protect the whole device from scratches wherever iPhone users go." Ivyskin's case offerings for iPhone 3G include Xylo, XyloDuo, and XyloT3. Other accessories available for iPhone 3G include SpyScreen, XyloReflect, iGlass and an array of full body armors. XyloT3™ - XyloT3 for iPhone 3G features curved-shaped contours that wrap the new iPhone with a patent pending design of Xylo Surface Technology. The Touch-Thru is a real breakthrough in the industry, as it is a unique, sophisticated and elegant case with the first complete advanced touch interface that registers changes in the ultrasonic waves and position of the touch event and sends this information to the iPhone's screen for processing. This is a truly revolutionary case designed right here in the US of A.
XyloDuo - Providing the ultimate luxury in iPhone cases, its sophisticated design accentuates the modern individual. Featuring bumper to bumper protection for iPhone 3G and amazing high-graded polysilicon material, XyloDuo's minimalist all-silicon design integrates a discrete protective screen that blends seamlessly with durable black smooth silicon and is remarkably slim. It features a unique coating on the silicone which gives it a smoother, more polished look and creates a lint free surface. XyloReflect - Xylo reflect Screen is a solid hard plastic screen that provides a crystal clear view of the iPhone. This unique product has good specular reflection; that is, it is smooth enough to form an image when the iPhone 3G is not in use. 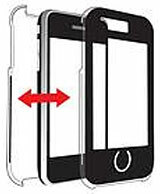 The Xylo reflect Screen easily adheres to the iPhone's screen without the use of any adhesives. It allows your fingers to slide freely, offering full touch sensitivity and screen protection that is second to none in the market today. SpyScreen - For your eyes only. The Privacy Screen provides security for +/- 45 degrees that helps to keep prying eyes from personal information. When viewed directly, the privacy film gives you a clear view of your display. Angled views appear tinted, near complete black, to create an effective privacy barrier. The SpyScreen's privacy film easily adheres to the iPhone's screen without the use of adhesives. It allows your fingers to slide freely, offering full touch sensitivity and screen protection. iGlass - Ivyskin's latest Screen Protector. This is a solid 1mm Hard Screen glass that goes over the iPhone. Think of this as a second screen on your iPhone. It is made of the same glass screen as the iPhone, tough, hard, anti-scratched. Ivyskin's products are designed here in the USA. Ivyskin is proud to be an American company that designs, manufactures and delivers useful and fun solutions for digital entertainment and personal computing to people in the Americas, Europe, and Asia. PR: iSkin has introduced its new revo2 soft premium silicone protector designed especially for iPhone 3G - the second generation of the company's award-winning revo iPhone protector, introduced exactly one year ago. Designed for complete coverage in an elegant package, the revo2 gives iPhone fans protection, quality and style in a feature-filled package for their beloved iPhone 3G. Crafted for a superior fit, the revo2 snugly encapsulates the iPhone 3G and provides complete coverage from everyday hazards such as impact, shock, dirt, dust and moisture. Complimenting this protection is an array of impressive features, highlighted by Microban(a) antimicrobial product protection, a detachable ViSOR transparent face shield, a dust repelling micro-texture grip, integrated port-to-port protection, accented volume and power buttons, an anti-glare and anti-fingerprint screen film, unobstructed silent mode switch, mic, camera and speaker access, and an industry first: a special translucent silicone zone that protects the iPhone's proximity and ambient light sensors without obstruction. The revo2 is also compatible with the iSkin revoClip (sold-separately): a belt holster that keeps iPhones and their owners safely connected. Offered in a range of fashionable two-tone colors combinations: Onyx (Black/Black), Diablo (Red/Black), Sonic (Blue/Black) and Ozone (Clear/Black), the revo2 retails for $39.99. 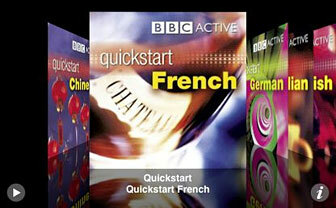 PR: BBC Active is re-launching its Quickstart language-learning series, which has now been fully optimised for use with your iPod or iPhone. Working with iPod and Mobile software developers Coolgorilla, BBC Active has developed these new products so that in addition to listening to the audio course, you can also view the accompanying translations and course text on the screen of your iPod or iPhone. Chapters within each episode enable users to navigate easily around the courses, making it simple to pick up key phrases such as booking a hotel, getting directions or ordering a meal. This innovation means that your Quickstart to any language is now as portable as your iPod or iPhone. The series contains eight languages - Arabic, Chinese, French, German, Greek, Italian, Portuguese and Spanish and come as part of a two-CD package retailing at £13.99. .Available from early August see http://www.bbcactive.com/languages languages for more info. Coolgorilla are a pioneering UK software development company specialising in the creation of applications for iPod, iPhone and mobile devices. Artwizz was created in 2004 in Berlin, Germany to further the development of intelligently designed accessories for entertainment electronics. They have had great success with sophisticated iPod accessories and are eagerly working to produce the highest quality of accessories for iPhones as well. As the innovators of the first all inclusive hard protective iPhone case, Artwizz is now introducing their new collection of cases and protective covers specifically designed for iPhone 3G. The original SeeJacket Crystal case is now available for the iPhone 3G with the same snug, snap-on design and impact resistant polycarbonate construction with cutouts for easy access to controls and inputs through connector cutouts. The same classic, sleek and transparent case keeps the display completely viewable and functional while being fully protected and keeping the iPhone 3G the center of attention. To accompany the Crystal are the SeeJacket Silicone and SeeJacket Silicone 2C. Both are made from a high-quality, smooth silicone and including a ScratchStopper to protect the display, these SeeJacket Silicone cases offer complete protections for the iPhone 3G. The SeeJacket Silicone 2C is created with a dual silicone layer for added security. The cases are stain-resistant and washable and also offer users easy access to controls and inputs through cutouts. Artwizz has continued the new line of iPhone 3G products with this new exclusive trio: Leather Pouch, Leather Pouch Exquo and Leather Pouch Select. All three are handmade using high-quality leather and lined with velvet for an executive finish. Specifically, the Exquo is constructed out of Nubuck Leather embossed with a unique urban design while the Select model is made with Straight leather with a stylish print design. The simple pull-to-release method is used for both Leather Pouch Exquo and Select, yet all three provide quick and easy access to the iPhone 3G while providing remarkable protection. 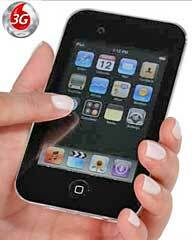 Finally, Artwizz also has among their new line of iPhone 3G products the popular MirrorFilm and ScratchStopper. Both the MirrorFilm and ScratchStopper are coverings that protect the display against dust and scratches. These display coverings do not impede the function of the touchable screen and if removed, they leave no residue. The MirrorFilm offers a unique feature as it is clear when the display is on and then shows a mirror effect when the display is off. The ScratchStopper on the other hand is completely transparent and is easily washable. A microfiber cloth also accompanies the ScratchStopper for easy cleaning. I might add that the mirrorfilm can be used in junction with the SeeJacket Crystal case. PR: The BP-S500 can broadcast stereo music over longer time. Generally Speaking, when BP-S500 is fully charged and does not charge for iPhone, it can play more than 12 hours , if charging iPhone, it still can play more than 8 hours and act as a mobile energy to supply power to the iPhone. It just takes 50-80 minutes to charge iPhone battery Fully. 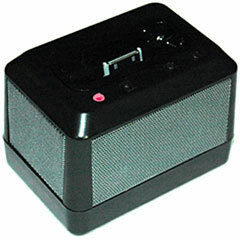 BP-S500 can act as a mobile energy to supply power to iPod if iPod is in low power, it just takes 50-80 minutes to charge iPod battery fully.